Builder’s tea is an English colloquial term for the sort of strong, inexpensive tea drunk by construction workers taking a break. It is usually served in a mug. Or you can just ask the builders to hold a tea bag in their mouths while you pour the hot water – if you don’t like them. First transmitted in 1964, this film charts how London has grown in size and spread into the surrounding country. Written and narrated by architectural critic Reyner Banham, A City Crowned with Green describes the unique character of London as a capital city. Banham looks at how it has, from the time of Elizabeth I, defied the efforts of the planners to curb its growth but he is alarmed by the urban sprawl. Is to too late to get back closer to the heart and make London a city crowned with green? History of London, from London City to Greater London on BBC website. It is often useful to incorporate reinforcements when working with bricks or building blocks. Applications include extension walls, block partitions and free standing garden walls. Apart from rolled steel bars, which are occasionally used for vertical reinforcement, nearly all the reinforcements employed in brick or blockwork are inserted on a horizontal plane. Used in this way, they can make up for unavoidable breaks in bonding patterns or add strength to corners and changes in section. Single skin block structures are less sturdy than their brick equivalents and reinforcement is nearly always specified by the architect or building inspector and Specifications must be followed by the builders. All are mortared into the bedding joints as brick or block laying proceeds. Expanded metal, light mesh, or tramline reinforcement can be used between brick or block courses while twisted metal ‘butterfly’ ties are generally inserted across the line of the brickwork on a double thickness or cavity wall. The walls of most modern houses, extensions and outhouses are built in two layers with a cavity between. The inner wall is usually made of lightweight building blocks while the outer wall consists of bricks. To hold the two leaves together, steel wall ties must be built into the mortar joints between them. To strengthen the wall further, particularly if the building is higher than one storey, reinforcement must be added at certain weak points in the structure. These occur at changes of section in a brick wall, particularly above doors and windows. To strengthen these points, two lines of reinforcement should be added to the first one course above the opening and the second three or four courses higher up. The reinforcement should extend 600mm either side of the critical section. And where two openings are in close proximity, the strengthening will bear the stresses better if it is positioned in two lines above and between the openings. Our builders Clapham were called to install/build/expand an Access ramp for disabled wheelchairs and install handrails to an NHS Medical Surgery in Clapham, south west London, Borough of Lambeth. The wheelchair ramp must comply with the Health & Safety Regulation and the UK Building Regulation M document / Disability Discrimination Act 1995. Barratt Developments, the house builders have just made over £100m pre-tax profit in the first half of this year. They also said that a lack of mortgage lending was holding back a “sustainable” increase in housebuilding. When building a Conservatory you have two choices : Plastic or Wood. Both can have double glazing but not the same presence. Cheap conservatories are built using plastic frames, reinforced double glazing. A good trick is to use PVCu frames that looks like timber. You get a visual effect that might just be what you want. We cover Golders Green NW11 area. House Extensions, Loft Conversions, Garage Conversions, Refurbishments, Renovations Works, Bathrooms, Kitchens and all types of plumbing, electrical, Painting & Decorating Works. Police appeal as bogus builders scam £4,600 from elderly Muswell Hill, London, victim. An elderly woman who was duped into handing over £4,600 in cash to two bogus builders has spoken out in a bid to help police track them down. The 84-year-old, from the Fortis Green area of Muswell Hill, was taken in by the men who claimed they were builders working nearby who needed access to her home to tackle a water leak in her roof. Police believe the conmen lifted some tiles and poured water through the hole and down an internal wall to make the woman believe the work was urgent. They demanded cash to fix the problem, refusing to accept a cheque for the four-figure deposit offered by the woman to pay for drying equipment. Believing the situation was an emergency, the woman went straight out to get the cash, only later discovering that she had been duped. The bogus builders had knocked on her door at 12.30pm on July 18. Just an hour earlier the same pair are believed to have tried to dupe a 90-year-old man a couple of miles away in Barnet. Despite telling him urgent work was needed on his roof, the man challenged them and checked with a neighbour to find that no work was being done next door. The men left without taking any money. Officers are linking the two incidents and appealing for anyone else who may have been approached by the men to contact them. The suspects are both described as white men, one aged in his 50s,the other in his 30s. It is believed they drive a small white box panel van with a ladder on the roof. Det Con Jo Ravenhill of Haringey CID said: “I am determined to do all I can to catch these unscrupulous offenders who are targeting vulnerable residents in our community. “If you need work doing, go on recommendation, seek quotes, pay by traceable means, such as cheque or bank transfer. Don’t let anyone intimidate you into taking them on for work at the door there and then, you just don’t know who you’re letting into your home. Anyone with information is asked to contact Det Con Ravenhill of Haringey CID on 020 8345 0838, or Crimestoppers anonymously on 0800 555 111. Looking for a builder in London ? 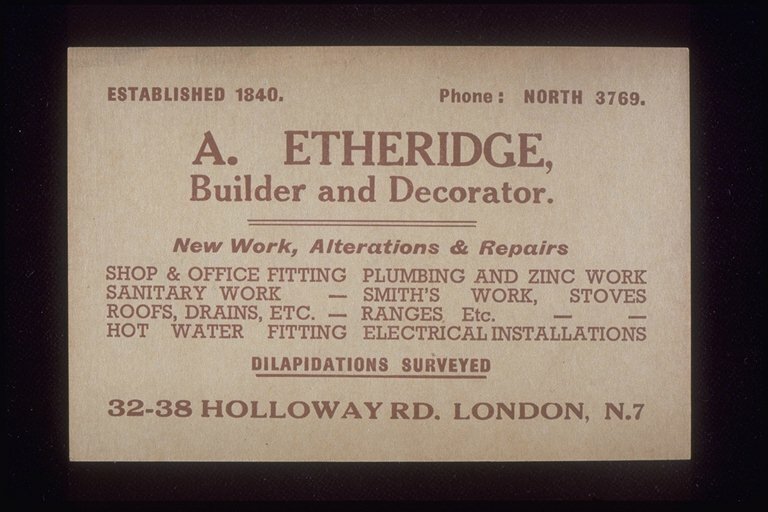 The business card of a Builder and Decorator based in North London, Holloway Road.